Conventional financial planning software and “free” online tools use the Replacement Rate method based on outdated, generic “Rules of Thumb.” This simplistic method “guesstimates” targets for spending and saving. These “targets” are the basis for your whole financial plan. If they are wrong—too high or too low—the mistakes compound over time and you’re in trouble. We don’t believe in guesswork. We have a smarter approach. In the early 1950s, Nobel Prize-winning economist Franco Modigliani and his colleague Richard Brumberg developed a groundbreaking theory called the Life-Cycle Hypothesis of saving and consumption. This common-sense theory, based on research and observation, basically says that people want their living standard to remain the same over the course of their lives. No one wants to splurge today and starve later in retirement –– or do the opposite. Economists call this behavior “Consumption Smoothing” because households want their consumption (spending) to remain the same over time. In fact, the goal of most households is to find the highest level of spending they can sustain for life. Simple concept, but calculating that spending level and a plan to sustain it is extremely complicated. MaxiFi takes this incredibly complex financial relationship, and makes it simple. It’s virtually impossible to find your household’s highest sustainable spending level. Income and expenses change every year and no financial decision stands alone: income affects taxes, taxes affect spending, Social Security benefits and retirement account withdrawals affect income, which affects taxes, and on and on. MaxiFi software makes it possible. It can correctly calculate the highest spending level your household’s income and assets can support and provide a plan to sustain and protect it for life. MaxiFi software uses iterative dynamic programming methods developed by our founder and President Laurence Kotlikoff. These methods are similar to those used in bioinformatics and aerospace engineering––actual rocket science. It's why MaxiFi software is the only software powerful and accurate enough to put the Economics Approach into action. While built on solid economic theory and highly sophisticated programming, MaxiFi software is easy to use and puts you in the driver’s seat. After entering your financial information, MaxiFi software generates a Base Plan that provides your highest sustainable spending level, a plan for managing your assets to sustain it, life insurance suggestions for protecting it, and much more detail about your financial future. 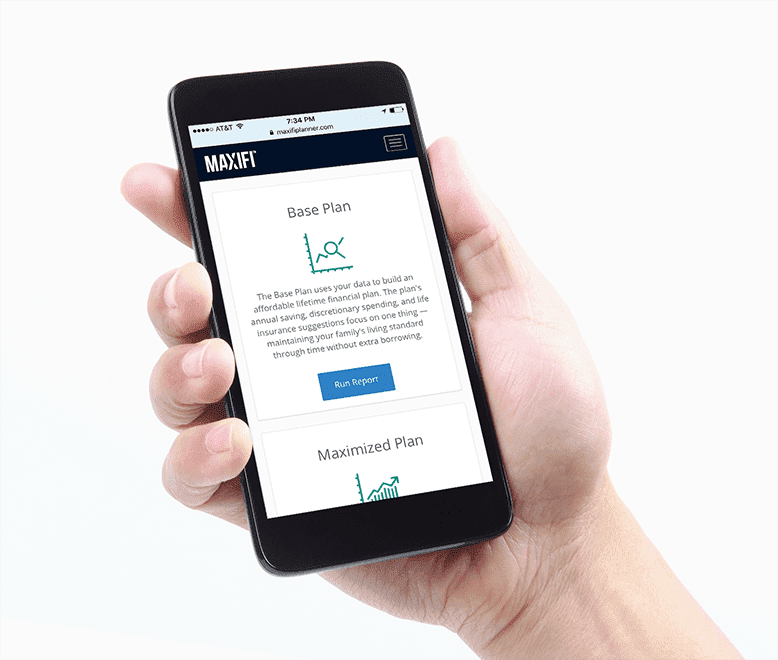 MaxiFi's optimization engine can raise your household’s spending level by finding the best Social Security filing strategy to get the highest benefits, determining when to withdraw from your retirement accounts to lower your taxes, and more. Whenever your financial situation changes or you’re facing a decision that could affect your finances, simply return to MaxiFi software, adjust your inputs and assumptions, and see how your plan is impacted. 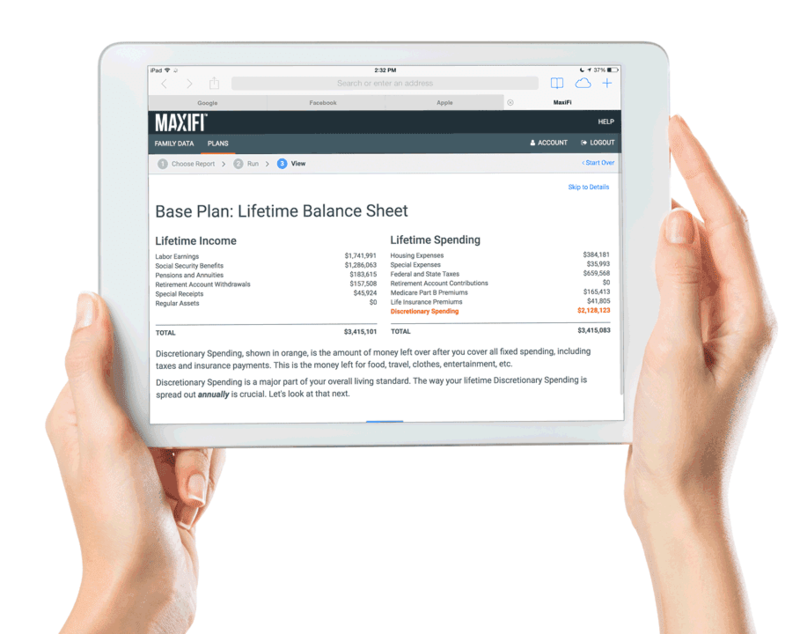 MaxiFi software is valuable at every stage of life to help keep your personal financial plan on track.